What Will $19 Buy You? Good morning. All week long we at Women AdvaNCe spent some serious time thinking about YOU. This week was a doozy. Lawmakers are working to put six constitutional amendments on the November ballot that could significantly change the course of our state. Critics say their language is misleading and we want to make sure you know what you’re voting for or against. Beyond current events, we are amplifying the voices of women as they share their world. Women AdvaNCe Leadership Team member Antionette shared her experience with wage disparity as a black woman. Our summer intern Joy wrote a heartwarming story about her experience at the Black Women’s Roundtable gathering. All of that in one week and much more. You trust us to stay on top of it, every day and night. Whether it is shining a light on economic injustice, exposing gender discrimination, or inspirational global stories of triumph over malevolent, inhumane practices perpetrated on young women. You look to us to keep you current on many of the issues that you care about. And some that you never knew before seeing it here on our website. So the question is, what is it worth to you? To the state? To our daughters? 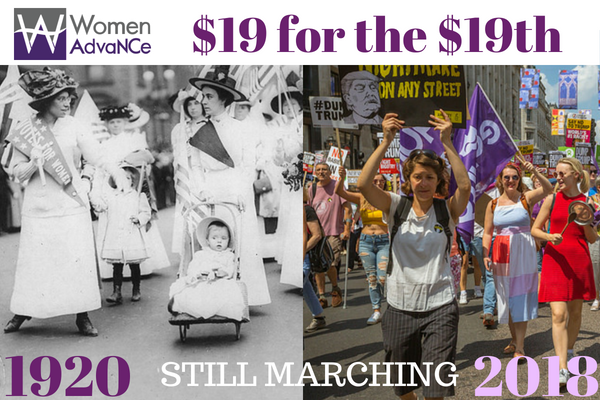 We hope at least $19 in honor of the passage of the 19th Amendment. 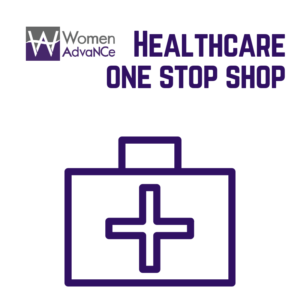 Nineteen dollars barely buys a nice meal, and in most cases a pair of shoes, but it does support the work of Women AdvaNCe. Your $19 donation helps us pay for these stories, articles, calls to action, leadership development, community outreach, and annual gatherings that bring us together. 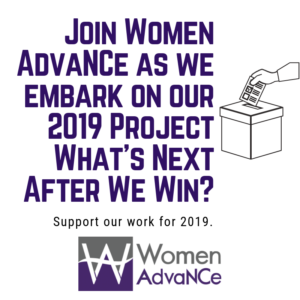 Our writers and staff at Women AdvaNCe work day and night to cover and bring these important events to you every single day, 365 days a year. We cannot do this without you and every dollar brings us closer to advancing the change in North Carolina. Will you click on the donate icon right now and help us get to our goal of $1,000 before August 18th? Why is that date significant? Because that’s when women in our country got the right to vote. Ninety-eight years ago in 1920, powerful and courageous women stood up and stepped in to history. They were fearless and determined and did not rest until women in the United States got full rights that were written into the Declaration of Independence. Donate now. You will keep getting the news and information just right for YOU. We will reach you where YOU live. We will be there to send you breaking news and we will remind you to take action in your community and in our state. A VOTE of confidence is sometimes all we need. 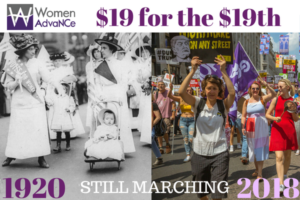 So, thank you for donating $19 for the 19th Amendment. Let’s keep AdvaNCing the Change!